This Webpage is provided as a tool for the veterans I serve in the Maryland and DC area. Everyone calls me Wes. My home Church is Anchor Baptist Church, in Faulkner Maryland you can find it's Website at anchor1611.org . 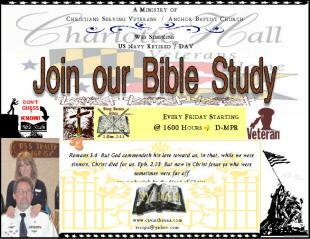 I serve my veterans through the ministry of CSV Christians Serving Veterans. I work with the local Veterans homes in my area, helping with audio visual historical projects and computer needs of the veterans there. I'm also privileged to teach a Bible study at the Charlotte Hall Veterans Home on Friday afternoons at 1600 hours. Some of the outlines from my Bible Studies you will see here are notes from classes I teach there, my personal Bible studies. Please pray for these men and this ministry, thank you.